Basil's Blog: Remember when men used to play sports? Major League Baseball plans to change the rules so that catchers won't be able to block the plate, and runners can't target the catcher. You know the deal. Runner on the base path heads for home. Outfielder throws to the plate. Catcher stands just down the third base line to grab the throw and tag the runner out. Collision at the plate. July 14, 1970. Riverfront Stadium in Cincinnati. The All-Star game. The National League had tied the game at 4 with a three-run bottom of the ninth. Now, it's the 12th inning. The Angels' Clyde Wright is pitching in relief. He had thrown a no-hitter a week-and-a-half earlier and was in the middle of a 20+ win season. 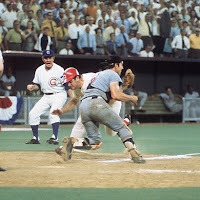 He got the first two batters, then the Reds' Pete Rose and the Dodgers' Billy Grabarkewitz hit back-to-back singles, putting runners on first and second. The Cubs' Jim Hickman then singled to center, and the Royals' Amos Otis fired the ball to the Indians' Ray Fosse who was behind the plate. The ball was just to the third-base side of the plate, and Fosse was in position to take the throw. Rose hit Fosse, who wasn't able to field the ball, and scored the winning run. Those that were watching the game on TV that night -- me included -- will never forget it. That was a classic baseball moment. Fosse was hurt on the play, but continued his career until 1979 when a different injury ended his career. He made it back to the All-Star game the next season, and won two World Series rings with the A's in '73 and '74. Rose was later banned from baseball for gambling. But that was in the 1970s when players played that way. 1980s too. That's when men -- hard playing men, real men -- played baseball. Today, we have a commissioner who thought a tie All-Star game was a good idea, because it was late and people were tired. They had played 11 innings, after all. No, it was no longer the 1970s when a 12th inning collision at the plate was how an All-Star game ended. And now, the ladies that run Major League Baseball will make sure that never happens again. I'm thinking they'll start pitching underhand soon. And ban spikes on shoes. High heels will be okay. * Wooden bats and hardballs can maim. What kind of message does that send to our youth? Huh? They should switch to plastic bats and wiffle balls. * And all players - not just the catcher - should wear face guards. * It's no longer "three strikes and you're out." If you smile and say "pretty please" you get another pitch for being nice. * The seventh inning stretch should be moved to the 4th inning to reduce mid-game fatigue. Those 90-foot sprints can really tire you out! Off topic: Hey Basil, did NASA ever get back to you, and is there going to be an ISP up there so you can continue to post? I will be out of the office until 31 December 2013. I will respond at that time. The feminization of america continues to plan. Destroy all male sports. Destroy the concept of manliness in America. So now there's no hitting in baseball? The drive for "sports pussies can play too" continues. OH YAY THE BIG DUMB KNUCKLEDRAGGING MACHOMEN ARE ALL BUGGED BECAUSE THEY CANT SLAM INTO EACH OTHER LIKE DUMBASS CAVEMEN!!!!! !WHAT KIND OF MINDLESS PRIMITIVES ARE YOU PEOPLE?!?!!UGH!!!!!!UGH!!!!UGH!! !YEAH HATE EVERYTHING YOU CANT HIT OR POUND ON OR ABUSE OR KILL!!!!!UGH!! !SO MANLINESS IS BEING ABLE TO SLAM SOMEONE INTO A CONCUSSION OR MAYBE KILL THEM WITH A BASEBALL??? ?THATS SICK!!!UGH!! !NO WONDER MORE MEN ARE ARRESTED FOR DOMESTIC ABUSE THUS PROVING HOW TRULY MINDLESS AND WORTHLESS THEY REALLY ARE!!! !YOU DONT HEAR ABOUT PEOPLE LIKE JERRY SEINFELD OR BEN STILLER BULLYING OR BEATING UP ON PEOPLE NOW DO YOU???NO!! !ONLY PEOPLE LIKE THAT WINGNUT METALHEAD TED NUGENT WANTING TO SHOOT A CROSSBOW AT SOMEONE LIKE BIN LADEN IN ORDER TO PROVE HOW MACHO HE IS!!!UGH!!!UGH!!! !HELL JUSTIN BEEBER IS MORE OF A MAN AND HE DOESNT GO AROUND WANTING TO KILL PEOPLE WITH GUNS OR BOMBS!!!BASEBALL???UGH!!! !GO PLAY SOCCER!!!! Justin Beiber is a frikkn Canadian, 'nuf ced.